We focus our services to local families. Find us in your latest copy of Savannah Magazine! 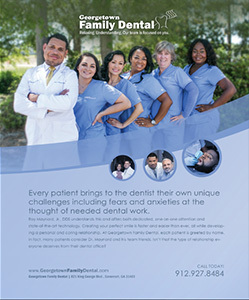 The entire team at Georgetown Family Dental maintain the highest levels of accreditation and pursue ongoing education to stay abreast of the latest trends in dentistry. Our office is located at 821 King George Blvd., Savannah, GA 31419. We offer ample parking in our parking lot. Please enter your zip code or city, state below for door-to-door directions.